First thing I had to do was gather the frames. I’ve seen so many cute gallery walls on Pinterest that had frames of all different sizes, colors, shapes, and even other decor besides frames but I decided to choose one color (black) and try different style frames. I wasn’t sure if OCD would kick in and I’d completely hate this in the end! All of the frames were under $10 at Walmart, Target, and The Dollar Tree. 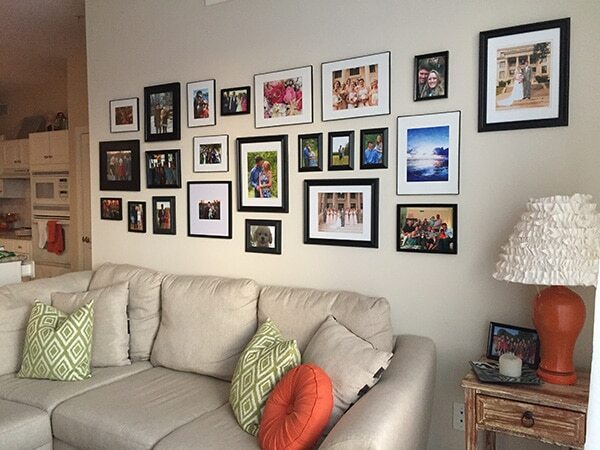 They are picture frames – no need to spend hundreds of dollars for them. 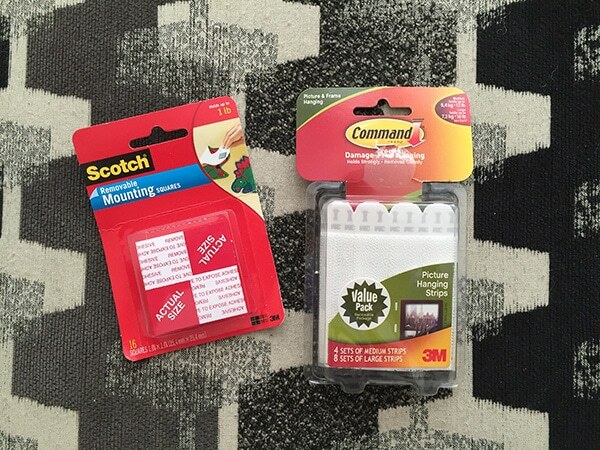 Plus the cheaper ones are more lightweight and easier to hang. 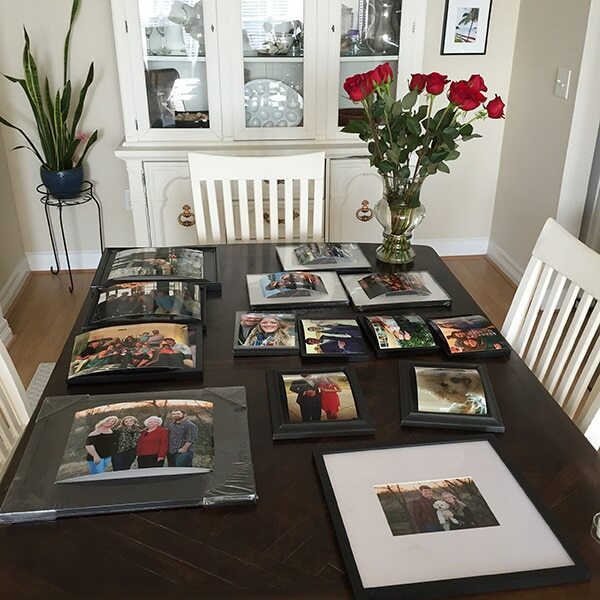 After deciding which pictures to print and getting them in their frames, the hard part is making the arrangement. Because I already had frames hung, I needed to find a layout that worked around those pictures. 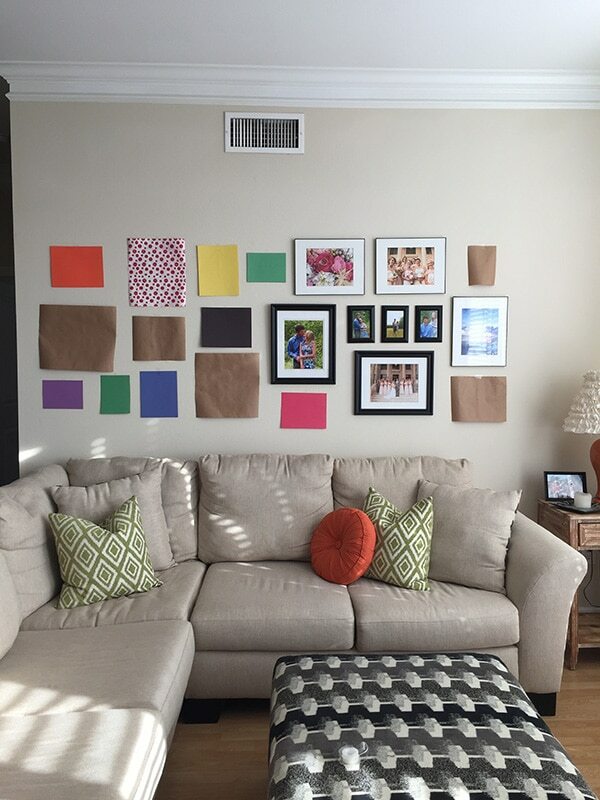 I used wrapping paper and construction paper to trace each frame and taped them up to decide where to hang the pictures. My first go round I just arranged the frames on the floor then hung them, but this time I needed to do a lot of rearranging to find the best layout. 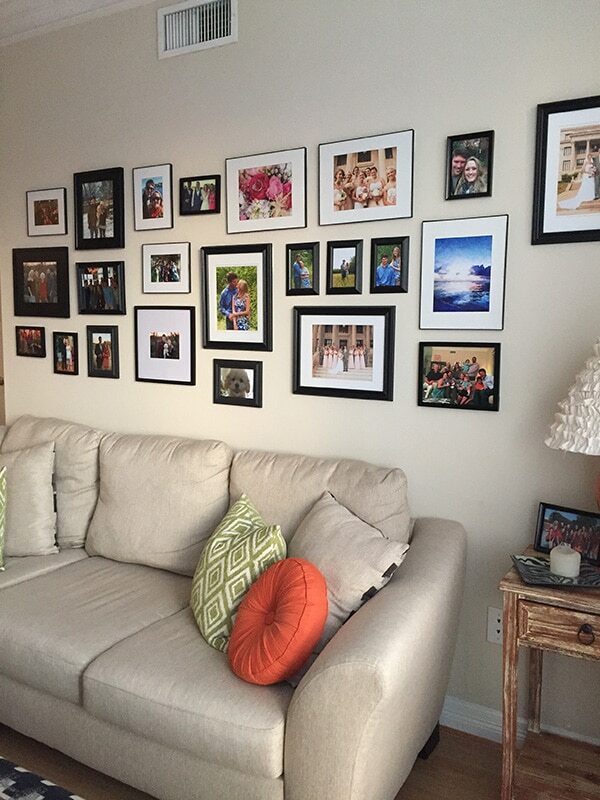 When it was time to hang, I had to come up with an alternative to 20 nail holes in the wall! I found Command Strips that worked great with these frames. You have to follow the instructions closely so they keep the pictures up. I found them at Target. 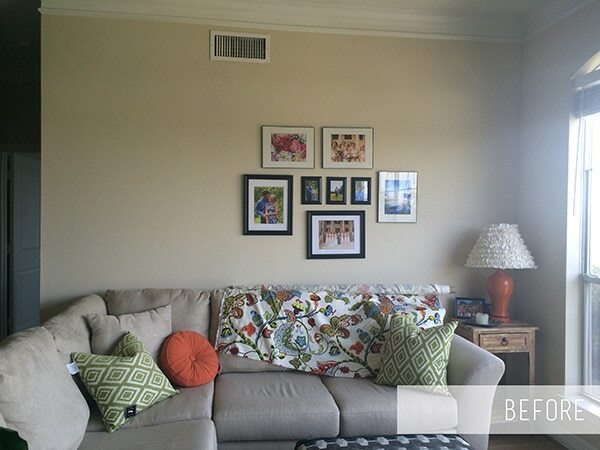 The mounting squares are really simple and work for smaller frames. the strips are a little bit more work but they can hold the larger frames. So there is the finished product! It looks SO different in there now! When I come in I’m still surprised when I see it. I love that I can see all these fun moments and the people I care about as soon as I walk in. The orange lamp I made myself 😉 See this post for details! 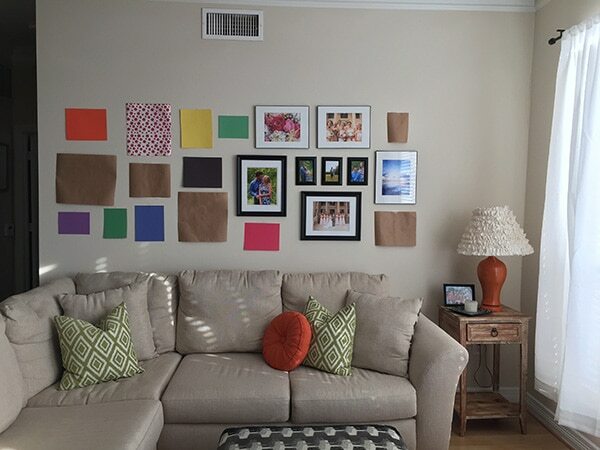 What a great idea to make a template for your gallery wall. I’m never quite so organized and sometimes end up with extra holes in the wall. BTW, thanks for the tip about the photo squares. I enjoyed meeting you at Thrive and look forward to more from you. It sure makes the room a very happy one ! Great. Brilliant! I want to do this for my bedroom, but wasn’t sure where to start. What a clever idea tracing them out to figure out the lay out. Totally doing this now thanks!